At LCI We Value All of Our Relationships – Especially the One with Our Planet. We’re serious about our commitment to the environment and the communities we serve. It’s a major consideration for how we conduct our business and who we choose to partner with. LCI sustainability programs benefit everyone – today and into the future. With initiatives like our Zero Landfill Cartridge Recycling program we’re able to meet the needs of our customers today, while lowering their carbon footprint and maintaining valuable resources for tomorrow. Green printing practices and strategies don’t need to be complex to be effective. By making a conscious and consistent effort to use less energy, paper, water and other resources, waste and costs can be easily reduced. Our business philosophy and solutions include a number of practices and eco-friendly options for day-to-day use, in addition to a number of long-term goals and initiatives. Our Zero Landfill Program eliminates the needs to burn, export or send components of a used print cartridge to the landfill. Every empty cartridge that is accepted for remanufacturing must meet strict standards. Cartridges that don’t meet those standards are broken down and the raw materials are recycled and used to create other consumer products. Consider the fact that every day 600,000 toner cartridges in North America alone end up heading to landfills. 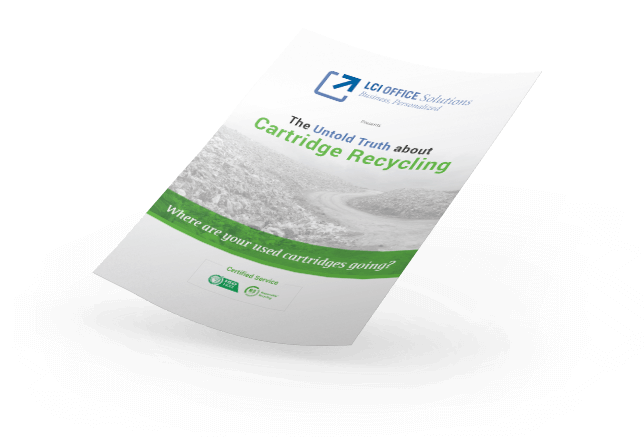 If you’re not sure of the true environmental impact of your current recycling program, let us introduce you to LCI Office Solutions Zero Landfill Program. Together, we can change the way business gets done. Download our informational brochure about LCI’s program to learn more about why it’s time to switch today. Through each step of the process from acquisition to delivery, set-up and removal, our team is dedicated to maintaining the highest environmental standards. Our feature rich machines are designed to save paper, toner and energy all while reducing your carbon footprint and impact on the environment. Plus, they lower your costs. It’s a win-win! Every ton of paper you recycle saves 17 trees and uses 50 percent less water, 64 percent less energy, and creates 74 percent less pollution. As part of our sustainability initiatives, paper recycling bins are placed throughout office work spaces, common areas and testing spaces. We encourage employees and visitors to use reusable cups or mugs provided by LCI, or to bring their own. Did you know that every year 20 million trees are used to make 56 billion paper cups in the US which are ultimately thrown away? Reusable cups and mugs make sense and offer a huge positive environmental impact. More that 300 million used ink and toner cartridges are thrown into landfills in the US each year. We recycle our used cartridges – do you? 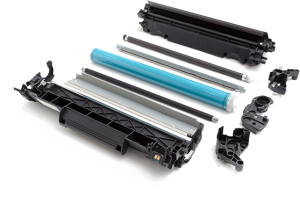 Contact an LCI Office Solutions team member to learn more about toner and ink cartridge recycling. Moving your processes toward a paperless office is one of the best ways to lower your costs and positively impact the environment. Our paperless office technology solutions can be customized to fit the unique needs of your business and can make your office more efficient and sustainable. 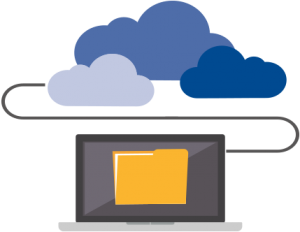 We offer customized solutions to help you digitally manage, secure, store, collaborate, edit and retrieve documents. 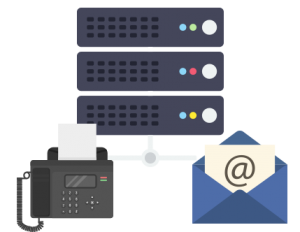 With a fax server, your faxes are received as an email attachment making distribution easy; lowering your costs and saving time, energy and consumables. 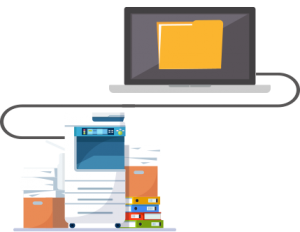 Converting hard copy documents to a digital format can reduce paper use, make sharing and collaboration easier, improve document search and retrieval and reduce storage needs. Plus, digital documents can save you money! Call us today to learn how we can help you lower your carbon footprint, improve sustainability, lessen your company’s environmental impact and save you money!